Your typical Medieval PBL unit would typically be built around a driving question like “What was life like in 14th century England?” Students would research clothing, art, music, food and perhaps have a culminating event like medieval bread baking. This is inauthentic PBL in my opinion and doesn’t do this incredible period of time justice. 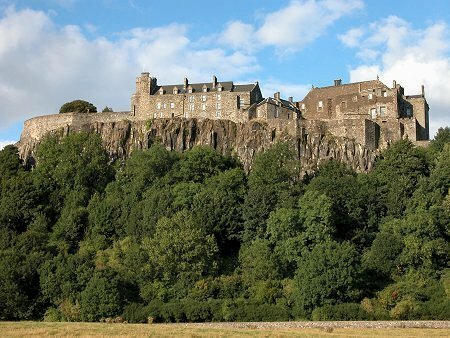 Stirling Castle, standing high on a Volcanic crag, dominates the land below, and is equalled only by Edinburgh Castle in it’s age and prestige. The Castle’s strategic importance, being situated as the gateway to the highlands, saw it besieged at least 15 times during it’s history. On a recent visit, I learnt that Stirling Castle changed hands 8 times during the Scottish Wars of Independence between 1296 – 1357. Geographically, the Castle is almost impregnable on three sides, so its defences were focused on the inclined approach from the south-east. As I walked the Castle’s walls and looked out towards Stirling Bridge and then the fields of Bannockburn, I wandered why, given the fortress-like nature and position of this Castle, was it susceptible to being sacked so frequently? This is a rich question that is open-ended enough to allow all students, after under-taking some preliminary research, scope to take this unit in the direction that interests them most. 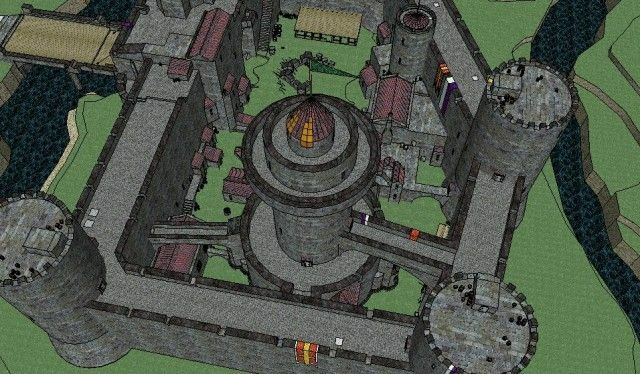 Using Sketchup or Minecraft, you could challenge your students to re-design Stirling Castle, inline with the geography and technologies of the day, to be able to better withstand an attack or invasion. This approach would allow you to investigate politics, architecture, geography, science, materials, mathematics and culture, all through the lens of the Castle. Students would investigate a Castle as a defensive structure built for strategic purposes and investigate the different architectural components like towers, defensive walls, inside buildings, etc. Even better, you could get them into some game-based learning using Castles 1&2. I remember first playing this castle-building sim on my Amiga 600, and it has stood the test of time surprisingly well. For only $5.99, it should be affordable for most schools. “Welcome to the world of Castles – a game of medieval diplomacy, treachery and power. To win you must survive. To survive you must scout the surrounding territories, defeat the local militias, subjugate the land with a Castle, feed and maintain the people, forge diplomatics alliances, appease the Church and unite the land under your iron fist. In Video Games and Learning, Kurt Squires talks about the cognitive benefits of having students explore history by having it situated in context. Using games like Civilization or Castle’s to explore history, not only provides this situated context but allows an even more sophisticated form of experiential pedagogy to emerge where bias, gameplay, mechanics, inaccuracies, simplifications, generalisations and perspectives can all be explored. Dawn Hallybone recently hosted Lynette Barr and I at Oakdale Junior School, where we got to see some games-based learning in action in a primary setting. 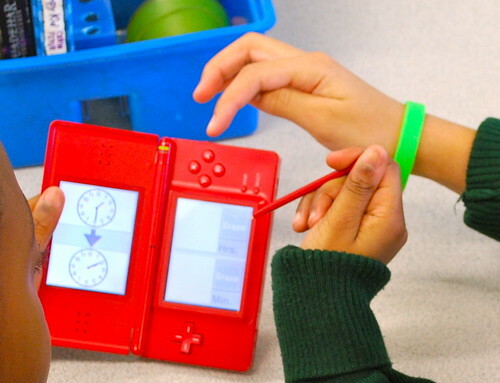 As the students entered the room they were instructed to collect a Nintendo DS and then sitting in pairs, use the Time Lapse activity, which is part of Dr Kawashima’s Brain Training. Time Lapse displays two analog clocks and requires the students to calculate the difference in time between these clocks. The students were given ten minutes to complete as many of the problems as possible. Students were discussing their strategies and engaging in some genuine collaborative problem solving. Too often, students are put into ‘solitary confinement’ in the classroom due to traditionalists evoking romantic, and somewhat deluded notions of nostalgia, where ‘rigorous learning’ only occurs independently, but this deprives students of one another’s ideas and disagreements. the findings of the small scale Improving Mental Mathematics research trial conducted by Learning and Teaching Scotland. Repetition, reinforcement, processing, active learning and communication were all evident as students ‘oohhed’ and ‘ahhed’ there way through a game of ten-pin bowling. 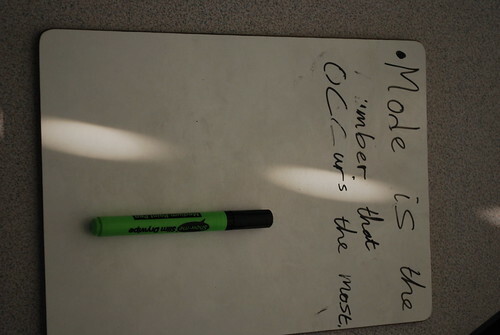 Something very simple that shifted the emphasis of the classroom, was the fact that each group had a small whiteboard and whiteboard marker to use – this shifted the emphasis from taking notes and filling in worksheets, to having students internalize the concepts by engaging in discussions with their peers and their teacher. Something simple, but I felt it made a real difference to engagement levels. Every minute a teacher is doing the talking is a minute this isn’t happening. Very little direct instruction was given as Dawn didn’t monopolize the classroom and gave her students a real chance to talk – and therefore to learn. A big thanks to Dawn for her hospitality! From Newton’s clockwork universe through to Einstein’s relativistic effects of time dilation, classic science fiction movies like 12 Monkeys, Terminator and Inception, through to the deep philosophical questions of Plato and Aristotle – the human race has an inherent fascination with time. More simply though, ask your students “Why do different parts of the world have different times?” and you will get a variety of answers. In fact, ask many adults the same question and expect to get the same wide variety of responses. The Royal Observatory in Greenwich is the home of Greenwich Mean Time (GMT) and the Prime Meridian. A meridian is a north-south line selected as the zero reference line for astronomical observations. The line in Greenwich represents the Prime Meridian of the World – a longitude of 0 degrees. Every place on Earth is measured in terms of its distance east or west from this line. Before 1851, when this absolute reference point was first established, almost every town in the world kept it’s own local time. There were no national or international conventions which set how time should be measured. However, with the vast expansion of the railway and communications networks during the 1850’s, the worldwide need for an international time standard became imperative. The world’s time zones are based on the fact that the Earth moves through 15 degrees of longitude each hour. Therefore, there are 24 standard time zones (24 hours x 15 degrees = 360). Time zones are counted from the Prime Meridian, with each time zone based on a central meridian, counted at 15 degree intervals from the Prime Meridian, and extends 7.5 degrees to either side of the central meridian. For example, New York City lies in the zone of the 75 degrees west meridian, and that time zone includes all locations between 67.5 degrees west and 82.5 degrees west. Using Google Earth, and generating random locations, have students note latitude/longitude of destinations and work out the time in that location. You could also have them investigate physical features of locations and have them answer questions that involve estimation: eg. If one of the locations was Egypt – How far is it from Burundi to the mouth of the Nile? The idea of time zones, latitude and longitude is an important one in a world increasingly reliant on GPS. It is not enough for students to use new gadgets or tools, but rather they need to have a certain level of understanding of how these new gadgets or tools actually operate. What do people think – Is it important for students to know about time zones when they can quite easily use the web to find the time anywhere in the world in an instant? Oxford is one of my favourite places in the world. It is like stepping back in time – from the ancient buildings and grand architecture, Christ Church College, to the feel of an important sense of history and ancient traditions; time seems to slow down. This visit, among many other things, I visited The Bear Inn and the Eagle and Child Pub, two of the oldest pubs in Oxford. The Eagle and Child Pub is famous as the pub that the Inklings came to discuss literature, writing and life during the 40’s and 50’s. Members of the Inklings included C.S. Lewis and J.R.R. Tolkien and it is now lore that discussions at this pub contributed to the Lord of the Rings series and the Narnia books. But I got to thinking about how the Inklings, as a literary group, actually publicly read each other their unfinished work, had it critiqued, and then held discussions and debates around the writing. In school, typically the process is that students write and then hand it in to the teacher for a grade – if they are lucky, the teacher may ask them to post it on a blog. This assessment is summative and depending on the circumstance, one could argue that the student learns very little about the process, irrespective of the depth of feedback obtained from their teacher. I was recommended the book The Inklings of Oxford: C.S. Lewis, J.R.R. Tolkien and their Friends. Below is the Trailer. From an education perspective, games and game design can teach students system thinking, logical reasoning, spatial awareness, strategy, game theory, the difference between zero-sum and positive/negative-sum games, design thinking, games with complete as opposed to games with incomplete information and how this changes the dynamic of the game etc. – and these are just traditional games. If we start talking about digital games and game design we can also talk about computer science and a host of other important skills and key 21st century competencies that students will need to be successful in a multi-disciplinary, high-tech world. Games provide meaningful situations for the application of thinking skills that could be dependent or independent of specific skills eg. mathematics. But there is also a big chance to explore cultural and historical perspectives of games. At the start of each class have students play a unique game that has been used by a particular culture at a period in time – one such game could be Nim. Allow students sufficient time to play the game. What strategies are they employing? How long does it take to come up with an optimal strategy? Is there a blocking strategy? Is there an advantage for the player going first/second? Does it matter? Then try variations of the game (there are over 70 variations to the game of Nim). Explore the mechanics of the game – does altering the game change students strategies? Have students ‘hack’ the game – how can we change the game to make it easier, more difficult, more interesting? Can we add bias to the game? Once the game as been explored, have students research the historical and cultural aspects of the game. Have students pick a particular era/culture or moment in history that interests or intrigues them, and then have students design a game that would fit with what we know about that point in time. Some examples of games to use could be found on the Games in Education wiki or from this list of research papers about games used in different cultures. The most recent addition to the Games in Education wiki is the Ancient Egyptian game, Senet. I came across Senet today whilst wandering the Ancient Egypt exhibition at the British Museum (British Museum description). The oldest known representation of Senet is in a painting from the tomb of Hesy (Third Dynasty circa 2686-2613 BC). The Senet game board is a grid of thirty squares, arranged in three rows of ten. A Senet board has two sets of pawns, and the actual rules of the game are a topic of debate (perfect for the classroom – read Gaming with the Gods). Senet historians Timothy Kendell (rules) and R.C. Bell (rules) have each proposed their own sets of rules to play the game. Why not have students form teams to debate the rules that Kendell and Bell have proposed? And then have them come up with some alternative rules, that they have collaboratively constructed using the evidence they have collected from their analysis of culture and history? This is authentic learning at its best.